Joseph Wright of Derby was one of the best painters in England and considered a highly original artist whose works included genre paintings, landscapes and portraits. He was the first artist who created genre paintings focused on the industrial revolution in Britain. That was beside the fact that he studied the works of Renaissance masters for two years in Italy. Some of his most unforgettable works were workshops with darkened interiors and scenes depicting people conducting scientific experiments. Most of his works on this subject showed his mastery of chiaroscuro and the influence of Dutch Realism of the 17th century and the works of Caravaggio, particularly in his candlelit scenes that were extremely powerful in their presentation. He’s a leading member of Romanticism, mainly for his choice of innovative subjects, his use of tenebrism (pronounced chiaroscuro) and chiaroscuro, the versatility of his painting technique and his substantial contribution to English Figurative Painting. 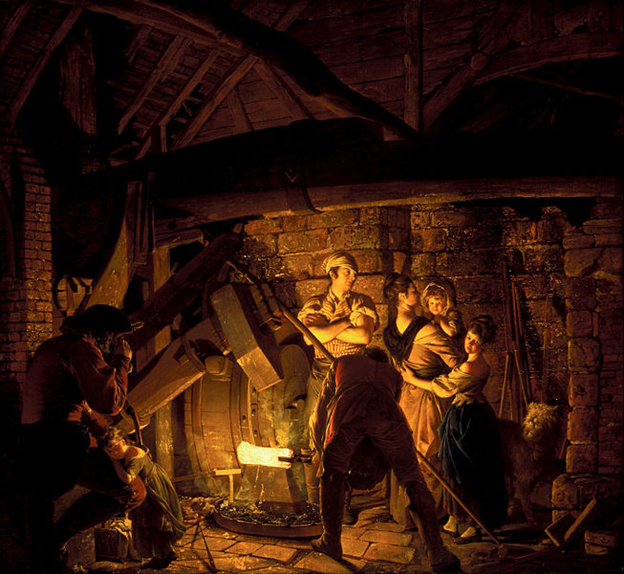 Joseph Wright was born in Derby on September 3, 1734 and for most of his life, stayed in his home town. He started his career as a portrait artist and became quite popular for his very distinct nocturnal paintings of industrial and scientific scenes that were shown during the yearly exhibitions in London by the Society of Artists. He was a business-savvy and ambitious person, who reached a wider audience by contracting the best engravers to reproduce his works, with the high quality prints made more available to more people. Like many other artists in the 18th century, he wanted to raise the reputation and standard of British art, eventually leading him to take an active role in the London art scene. He was a member of the board of directors of the Society of Artists from 1769 to 1771 and even exhibited some of his works with the Royal Academy, which was a rival institution of the Society. But disagreements over the treatment and display of his paintings at the Academy led him to set up a one-man show in 1785 at Covent Garden. He was one of the first artists to put up an individual show. Most of the exhibition pieces of Wright’s engaged and reflected the concerns, tastes and national ideas of the importance and public value of art in the 18th century. His inspirations were broad and reflected the encouragement and natural curiosity displayed by people involved in science and the arts. He was raised during the time when the Midlands was commercially, technologically and intellectually dynamic. He became one of the most enterprising and original artist in Britain, and was an important figure during the Age of Enlightenment in the country. He was renowned for his wonderful employment of the contrast of dark and light, particularly in his paintings where the subjects were candle-lit, such as “An Experiment on a Bird in the Air Pump,” “The Orrery,” “The Alchemist in Search of the Philosopher’s Stone” and “An Iron Forge. Wright learned to draw by copying prints long before he relocated to London in 1751 to study art under Thomas Hudson, a portrait painter who also taught Joshua Reynolds, who would later become the first president of London’s Royal Academy. Five years later he went back to Derby and set up a studio. He started as a portrait artist and developed paintings with high contrasts after seeing the works of Utrecht-based Baroque artists who were followers of Caravaggio. 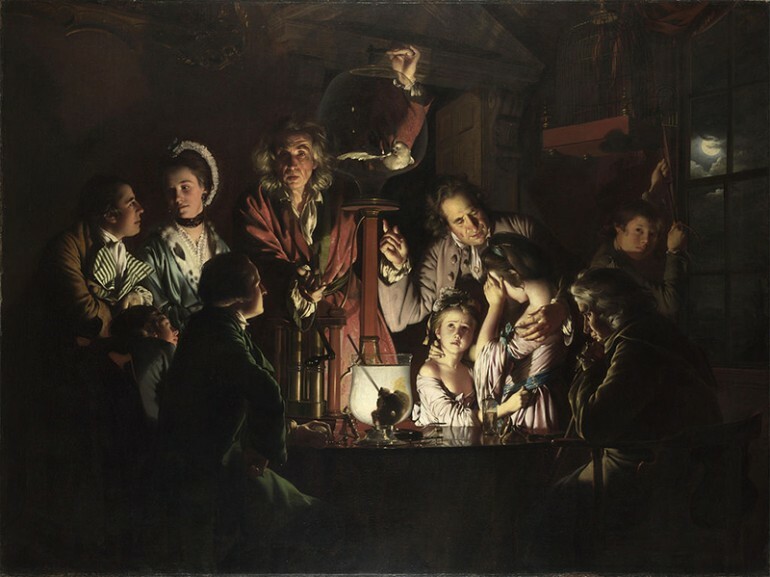 During Wright’s “candlelight period” one of the best examples of his work was “The Orrery.” In this painting, together with “An Experiment on a Bird in the Air Pump,” Wright showed his absorption with the education of the rising middle class and the levels of dramatic effects that could be achieved by using artificial light. Wright was not successful as a landscape artist and his primary source of income were his portraits. His portraiture showed a high degree of realism but his brushstrokes were romantic and soft. During his career, he regularly contributed to the exhibitions mounted by the London Royal Academy and the Society of Artists. He had been compared to genre painter Jean-Baptists Greuze, while he influenced many British painters including Samuel Palmer and JMW Turner. Joseph Wright of Derby died at age 63 in 1797.